Other animals may live in the same burrows as wombats. Rabbits sometimes dig their own smaller side tunnels in medium and major burrows occupied by wombats, and I have seen dusky antechinus emerging from small crevices in the walls of bare-nosed wombat burrows and the smaller brown antechinus and bush rats scurrying away from burrow entrances. Wild dogs and foxes sometimes occupy wombat burrows; while foxes are sometimes tolerated, they are generally disliked by wombats. Crushed skulls of foxes and dogs have been found in burrows, evidence of the wombat's well-known method of disposing of intruders, and I have seen a fox chased out of a burrow by an angry adult wombat. Other animals that have been reported in bare-nosed wombat burrows include echidnas, brushtail possums and cats. Rabbits have also been found in southerns' burrows, as well as geckos and stumpy-tailed lizards. The burrows of the northerns also have other occasional inhabitants, including dingoes, cats, echidnas, rufous bettongs and swamp wallabies. Goannas and pythons have also been found in wombat burrows. 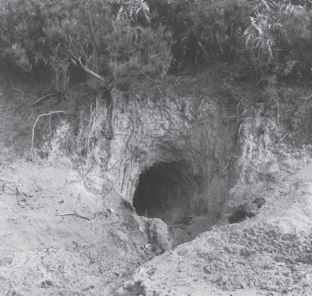 However, apart from these infrequent invasions, the wombat's burrow is a secure haven. It is easily defended against predators, gives protection from bushfires and other hazards and provides a cool, comfortable environment for the wombat's long day's rest.